My relationship with the piano has been life long. Pianos were always in our house growing up. My dad was a piano player. 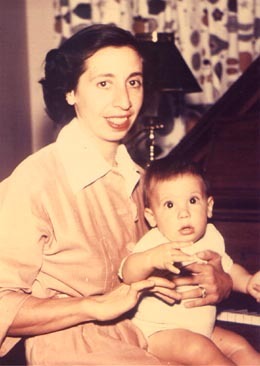 In our house in Sacramento in the 1950's and early 60's, piano technicians were frequent visitors. With one of them, at about age 9, I acquired a summer job. Through cleaning strings, sweeping the shop and following him around on tunings, I developed an interest that would become my life's work. While attending school at Santa Cruz High in the late '60s I did a little tuning and repairing, mostly on our home Baldwin Acrosonic. Then while traveling the country in various night club acts in the early '70's, I started tuning a little more, both on my own Yamaha CP70 that I traveled with, and other odd jobs I'd find on the road. In 1976 I started spending time in and around piano shops and people as I was able to find them, learning all I could. In 1977 I was living in Colorado, John Denver was on the radio every five minutes, and I was very much interested in ending my career as a working musician. I again turned to Piano Technology. I soon found The Aubrey Willis School of Piano Tuning and Repair, talked to Mr. Willis on the phone, and in a few days was in receipt of his correspondence course. I joined the Piano Technicians Guild in 1979 and, after passing a series of exams, became a Registered Piano Technician in 1980. Piano technology is a science and I have been learning it ever since, not only through experience, but through my membership in the Piano Technicians Guild. I have formed many relationships with other technicians whom I have great respect for. My shop is open to them as is theirs is to me, all I know about pianos is an open book to these great technicians I have met through the PTG, their same willingness to share with me has allowed us all to become true experts. I attend numerous technical seminars on both piano technology and woodworking. Piano tuning and repair has grown to include complete restoration of Steinways and other fine pianos. Custom design and rebuilding of actions and concert and recording studio tuning and voicing. The re-designing and building of new soundboards, bridges, scales and pinblocks. In 1979, having finally quit the music business, I returned to Santa Cruz County, then in 1986 I bought a home in Watsonville with enough room for pianos. Whether you are considering rebuilding a family heirloom or having your piano tuned, I will provide you with expert, honest and reliable service. 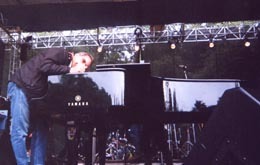 I have been a piano technician in Santa Cruz Co. and the surrounding area since 1979. I have tuned for well over 3500 private customers as well as schools, churches, any place that has a piano. Well that's not quite right, I won't tune a piano in a bar, I do other things in a bar, but don't call me to tune in one.
" Hey man, is that the only song you know?" 2015-I am building a new, bigger, better rebuilding shop in Royal Oaks, CA, North Montereay County. Estimated completion date before 2016. Look close, that's a Steinway. 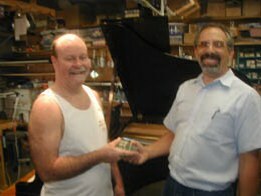 Happy customer paying happy piano technician for his rebuilt 1925 Steinway grand piano. Click here to see the piano.